Have I mentioned that we are going to have a blog hop linky party at the end of Blog Spa? No?! Well, we are! You see, Bev and I know that you all have some fabulous spa ideas as well﻿, and we don't want to miss out on even one. So on Saturday, you are invited to link up any and all of your fabulous spa related posts - tips, tutorials, advice, ideas. You can link up past posts or write up a new one up this week and join the fun! We can't wait! In the meantime, we still have some great tips/tutorials and giveaways coming up throughout the rest of this week because this week is all about taking care of YOU! If you are anything like the two of us, self care and pampering gets pushed to the back burner. 3) The day is full. 4) It doesn't seem that important. 5) I could go on and on. 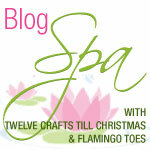 I have been having lots of fun with the blog spa hop! Thanks for hosting! Yesterday when you started, I gave myself a little pedi, and it was really nice! Thanks for the reminder to pamper myself every now and again! You are right we women don't do enough pampering. My personal secret is a face wrap you can do at home that uses a single bandage. http://www.thebeautywrap.com/wrap_facekit.asp I've tried it, it works well.